Can GM Food be Certified as Organic? 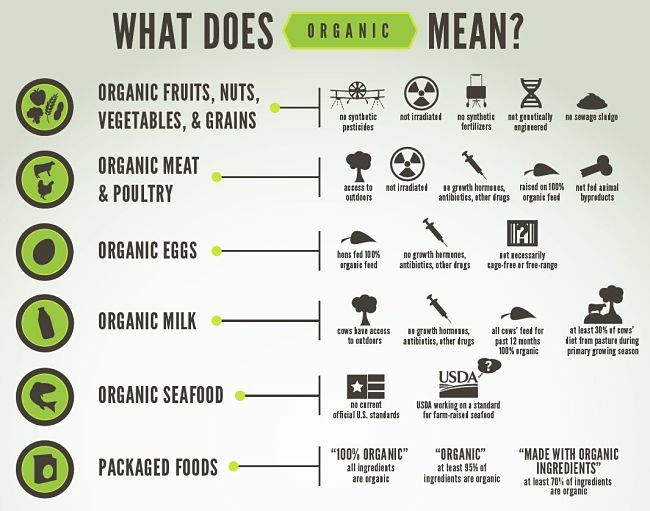 - Orgenic or Organogenic Foods? The rising unstoppable tide of GM crop introductions throughout the world poses every increasing risks of contamination of organic crops and foods. Is it time to accept the inevitable, and combine GM crops with organic growing techniques to feed the World? Organic farmers and consumers have lost the battle to keep Western Australia a GM crop free State, and have forecast bitter legal battles and compensation claims from contamination. Organic farmers in Western Australia could lose their ability to market their produce as organic or GM free. Is such contamination inevitable? Can it be controlled effectively? If so, How? Contamination has already been reported from a trial of GM Canola to a neighbouring certified organic farm in Western Australia. The National Association for Sustainable Agriculture, Australia (NASAA) an organic certifier in Australia, has decertified the affected portion of the farm (325 hectares) until it can be demonstrated that these areas are GM free. Certified organic farmers voluntarily accept higher scrutiny of their products, due to their commitment to the consumer to provide food that is organic and not genetically modified. NASAA certified organic produce has zero tolerance for GM content which is in line with the requirements of the National Standard for Organic & Bio-Dynamic Produce and the Australian National Organic Standard AS6000. This is to ensure the integrity and quality of NASAA organic produce for businesses and consumers alike [See note at the end of the article about GM and organic produce certification]. Many concerned organic farmers and organic food advocates have condemned the U.S. Department of Agriculture's recent decision to deregulate and approve the use of genetically modified Alfalfa. 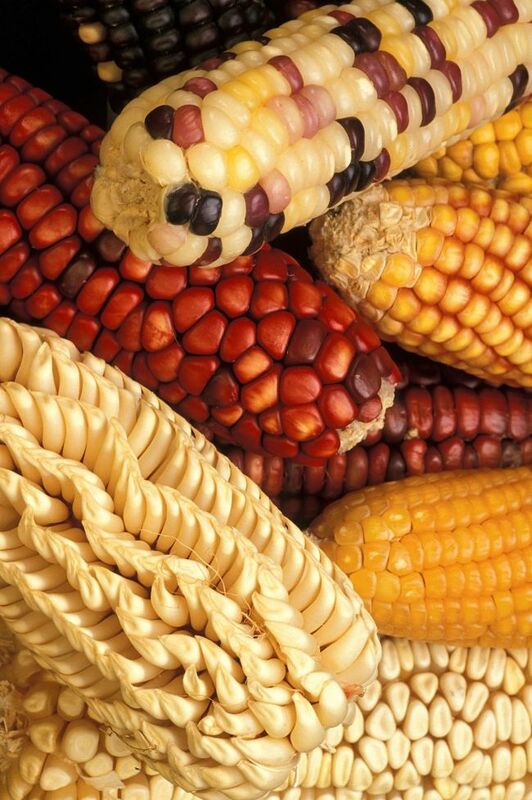 They claim it will lead to inevitable contamination of traditional and organic crops despite claims by the Federal Government that it would take steps to prevent these problems. Supporters say the use of GM seeds resistant to the weedkiller Roundup, mean that farmers can get higher yields and will help reduce food prices. Opponents say widespread planting of GM Alfalfa will result in pollen from these plants contaminating traditional and organic crops, destroying their value. Alfalfa is grown on approximately 20 million acres in the US, in almost every state, and is the 4th largest field crop behind crops such as wheat, corn and soybeans. Alfalfa is the main forage crop for beef cattle and dairy cows, especially grass-fed cattle, that are raised by organic farmers. Alfalfa is a perennial crop that can last for more than 5 years once planted. 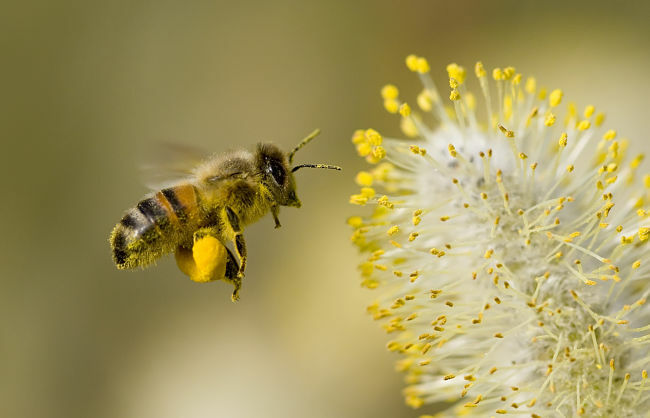 Alfalfa is also pollinated by bees, which means that each flowering season, all the non-GE Alfalfa plants within 5 miles of every GM Alfalfa plant could potentially be contaminated by GE genes. In addition, organic farmers are forecasting economic loses in export markets to Japan and the European Union , where food and agricultural products found to have traces of GM materials are consistently rejected and where there are strict labelling laws. In a novel approach that accepts the inevitable, several research scientists have suggested that GM foods be accepted as Organic Produce. Sir David Baulcombe from Cambridge University has stated that the organic and pro-GM arguments could be reconciled, and he has proposed a new approach, which he called "organogenics". The article is titled: Bridge the organic–GM divide to feed the world. He suggests there are many benefits from combining the useful outcomes of biotechnology with the best features of organic production to create useful applications to increase production and benefit the environment. Prof Baulcombe stated it was now generally accepted that world food production has to increase by at least 50% by the year 2030. Coupled with this is a projected decline in arable areas with large areas of agricultural land in Europe, particularly in the Mediterranean area, threatened by soil erosion. Prof Baulcombe said the challenge to feed the world in 2030 could be met if everyone kept an open mind to what new technology and improvements in crop management could offer. He claimed that genetic modification is probably the single most powerful tool. He highlighted the success of herbicide-resistant maize, virus resistant soft fruit crops, vitamin A-rich rice cultivars and many other opportunities. New transgenic crops could fight devastating plant diseases like potato blight removing the need for chemical controls. There was also great potential for improving storage properties of crops and development of dwarf varieties which made harvesting easier. Another example is the use of omega-3 enriched GM soybeans as a feed source for truly sustainable organic aquaculture. He stated that the long term grand challenge is to maximise the potential of well known hybrid vigour and to increase the efficiency of photosynthesis through conventional plant breeding, GM developments and better growing techniques. Future food production should also apply the best principles of organic farming, such as 'push-and-pull' cropping. A ‘push-pull’ strategy is a cropping system in which specifically chosen companion plants are grown in between and around the main crop. These companion plants release semiochemicals (signal chemicals for insects, such pheromones, attractants and repellents) that firstly, repel insect pests from the main crop (the 'push component') and secondly attract insect pests away from the main crop using a trap crop (the ‘pull’ component). The benefits of these approaches could be enhanced using GM components to get even higher yields. Agricultural Ecologist Sir Gordon Conway has argued that Organic Agriculture should be open to GE crops, which he called call 'Orgenic' Agriculture. 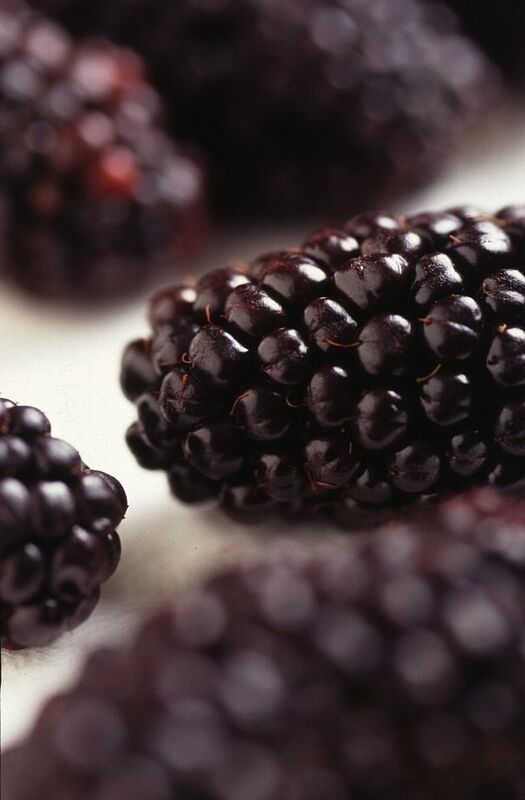 It is also referred to as Organic Transgenic Food. Conventional breeding is just as artificial as genetic engineering - both methods involve genes that are natural in origin. He forecast that by 2050 we are going to end up in a very interesting hybrid world produced by choosing technology because it worked not because of where it came from. Maybe: You can't Stop Progress? 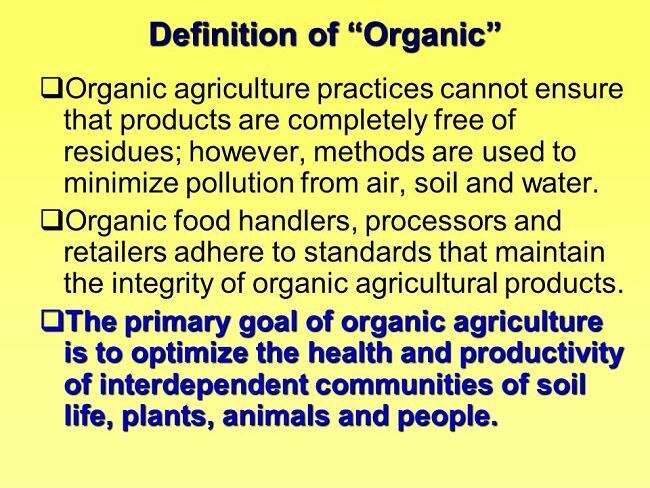 For organic certification, the use of non-organic pesticides (insecticides, fungicides, and herbicides) are not allowed. However, some sprays and chemicals, and other materials that meet agreed organic standards are sometimes permitted. In Australia and many other countries the national organic standard requires that all food for organic livestock be organic - either as purchased input or, preferably, produced on the farm. Feed supplements of agricultural origin must be of certified organic or biodynamic origin except where the operator can prove that the required products are not available. No routine use of antibiotics or growth hormones is permitted. In most countries, organic food and produce can not be genetically modified or engineered, nor can GM feed be used. Foods certified as organic or biodynamic should not contain any GM ingredients, according to most industry guidelines. It has been proposed nanotechnology techniques used in food and agriculture should also be excluded from certified organic food. The Soil Association (UK) has been the first organic certifier to exclude nanotechnology. Organic food production is a heavily regulated industry with the European Union, Canada, the United States, Japan and many other countries require producers to obtain special certification in order to market food as "organic" within their borders. Proposed changes to EU organic standards would have major implications for Australian trade and export in organic produce. In particular, the EU is proposing to establish a threshold of 0.9% for acceptance of the unintentional presence of approved GM material in organic products and 0.5% for organic seed. Australian standards are more stringent and could potentially disadvantage Australian food producers.